Tony Hill, Point Source, 1973. Performance view, Lichtburg Filmpalast, 60th International Short Film Festival Oberhausen, Germany, May 2, 2014. Tony Hill. 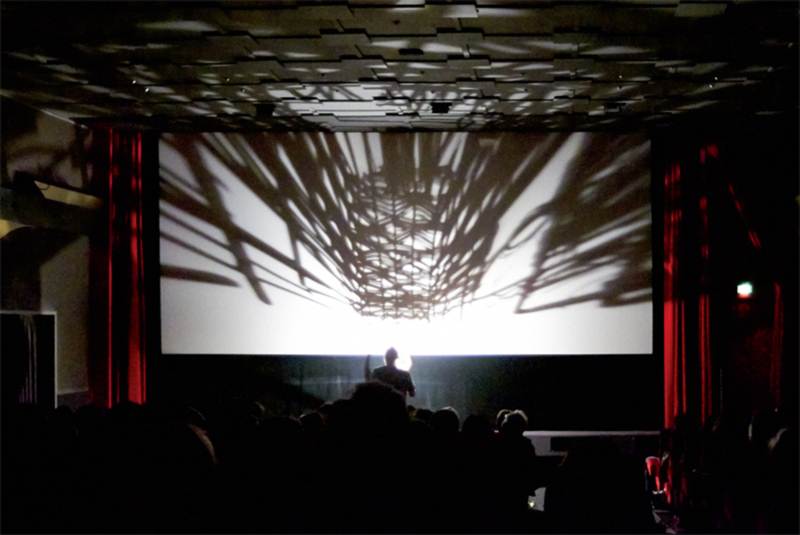 THIS PAST MAY, “Memories Can’t WaitFilm Without Film,” the theme program of the 2014 International Short Film Festival Oberhausen, began with a blank screen. No celluloid ran through the projector; instead, light was transmitted without intermediary, bright enough to bounce back and partially illuminate the faces of the seated spectators. Soon enough, members of the audience started to throw crumpled balls of paper in the way of the beam, causing shadows to appear on the screen. Others joined in, and paper airplanes began to soar, with laughter and conversation filling the room. The old cinema flyers that had been lying on the auditorium seatsfittingly enough, advertising a 3-D screening called “Aktivkino” that had taken place a month before in the very same spacetook to the air and flew toward the emptiness ahead. It was unclear exactly how the commotion began; no instruction had been given to the audience as a whole. Presumably, a few knowing spectators had been planted to set off a chain reaction. In the absence of the image, one’s attention was focused more on the series of playful interactions between spectators than it was on the shadow play. When the ruckus subsided, the program moved on to curator Mika Taanila’s next selection. Our collective re-creation of Hell’s Angels, 1969, the expanded-cinema performance conceived by Austrian filmmaker Ernst Schmidt Jr.and originally dedicated to Howard Hugheswas over. The expanded-cinema practices of the 1960s and ’70swhich gave rise to a headily diverse body of work ranging from Stan VanDerBeek’s Movie-Drome, 1963–65, to Hollis Frampton’s A Lecture, 1968, from Ken Jacobs’s Nervous System performances (1975–) to Tony Conrad’s “Yellow Movies,” 1972–73have been the subject of significant curatorial and scholarly attention in recent years, much of which has interrogated how these works negotiate the antipodes of intermedial expansion and reductionist specificity. To approach Hell’s Angels in this way, one might say that it offers a degree zero of cinematic exhibition: projector, screen, audience. Such considerations are of particular relevance today, as the cinema mutates and migrates under the pressures of digitization. But to stop here would be to neglect an issue arguably more central to Schmidt’s piece and one that plays a key role in accounting for the intensified interest film festivals and museums have recently shown in certain historical and contemporary works of expanded cinema: the liveness of the event. Hell’s Angels forgoes an understanding of cinema as founded in the sameness of mechanical reproduction in favor of activating the auditorium as a space of chance occurrence and encounter. Liveness is a way of cultivating the unforeseeable: One never knows precisely what might happen. Though the piece takes place within a stable set of parameters, it will never be the same twice; it will always be a re-presentation rather than a repetition. And perhaps most important, it will never be able to be downloaded from Karagarga or streamed on UbuWebat least not without devolving to the status of mere documentation. Taanila elaborated his theme of “Film Without Film” in a number of ways, including via videos constructed entirely of text (Young-Hae Chang Heavy Industries’ Hyperbole on My Mind, 2014) or of still images (Edgar Pêra’s dubious rendering of Auschwitz in 3-D, Stillness, 2014). But the overwhelming majority of the program followed Schmidt’s posthumous lead, integrating performative components in order to transform cinema from an art of reproduction into one of singularity and contingency, whether through magic-lantern shows, projector performances, film actions, or live musical accompaniment. Figures such as William Raban, valie export, and Tony Hill represented the 1960s and ’70s generation, while younger artists such as Aura Satz, Sandra Gibson and Luis Recoder, and Daniel Barrow testified to the ongoing vibrancy of this area of practice. The Oberhausen program thus joined events such as the celebration of Ken Jacobs’s work at this year’s Courtisane Festival in Ghent, Belgium, and Tate Modern’s fifteen-week “Art in Action” season in 2012 in making a strong claim for the conjunction of a pair of terms not often thought to have much to do with each other: cinema and liveness. The proposition that cinema might be a performing art clearly exerts a strong appeal today. But what are the precise contours ofand what exactly is at stake inthe recent liveness of live cinema? “LIVE CINEMA” sounds like a contradiction in terms. After all, if liveness is considered in relation to technological media at all, it tends to be thought to be the property of broadcast television and the Internet much more than of cinema, which depends on regulated repetitions of the prerecorded. Televisual “flow,” to use cultural critic Raymond Williams’s term, gives the impression of a ceaselessly unfolding now, even when the content being transmitted is not in fact live. As film theorist Mary Ann Doane has put it, “The temporal dimension of television . . . would seem to be that of an insistent ‘present-ness’a ‘This-is-going-on’rather than a ‘That-has-been’, a celebration of the instantaneous.”1 Web browsing inherits this temporality while exacerbating it through increased interactivity and customization. Not only is content often updated in real time, but the user possesses the ability to navigate through it at his or her volition, thus experiencing the liveness of a self-directed desire. By contrast, though bound to the present-tense unspooling of the film through the projector, cinematic exhibition is more properly located in the domain of the That-has-been. The spectator encounters an already-completed artwork that exists within an economy of the multiple as a copy without original. VALIE EXPORT, Abstract Film No. 2, 2014. Performance view, Kino Europa-Palast, 60th International Short Film Festival Oberhausen, Germany, May 3, 2014. But to view cinema solely as a medium of recorded reproducibility is to take an exceedingly narrow view of film history, one that excludes the diverse exhibition practices of early cinema and the avant-garde. For moving pictures were live from their very beginnings. Even before the development of the photographic support, magic-lantern shows, panoramas, and optical toys offered illusions of movement that depended on the agency of a human operator and incorporated significant variability from one performance to the next. After the advent of cinema proper, liveness remained a key feature of exhibition practice, particularly at the level of the sound trackor, rather, the sound accompaniment to the silent imagewhether in the performances of the showman-narrators who would weave stories out of a succession of tableau shots or in the music that would attend them. Though the kinship between early cinema and experimental film has long been noted, it has often been articulated in terms of shared textual preoccupations, such as a focus on visual delight or shock, an avoidance of narrative integration, and the employment of a reduced formal vocabulary.2 The embrace of liveness in many works of expanded cinema figures as an additional family resemblance with the preclassical eraone that unites radically different filmic practices across historical periods in a shared position outside a standardized, reproducible experience of the moving image. Despite this kinship, the significance of live cinema has changed immensely since the days of the benshi. It is one thing to stand outside a regime of repetition before it has been consolidated, quite another to depart from it after it has become the norm. In the 1960s and ’70s, live cinema emerged as a subset of broader efforts to expand cinema beyond its institutionalized form, manifesting most strongly in the American, Austrian, and British contexts. Set against the standardized practices of film exhibition, it reinjected a charge of contingency into a highly rationalized arena, very much in dialogue with contemporaneous developments in music, performance, and experimental theater. There is substantial literature devoted to this period, but strikingly less has been said about what live cinema might mean today, at a time when the historical character of liveness has been irrevocably altered by the advent of networked and mobile media. Just as there are significant differences between the meaning of liveness in preclassical cinema and its articulation in the ’60s and ’70s, so too does there exist a distinction between this latter period and our own. As media and performance scholar Philip Auslander has noted, “The idea of liveness is a moving target, a historically contingent concept whose meaning changes over time and is keyed to technological development. . . . Liveness describes a historical, rather than an ontological, condition.”3 Conceiving of liveness in this way is fundamental to making sense of the current interest in restaging interventions from fifty years ago, let alone understanding the work of the new generation. Within the context of its first performances, EXPORT’S Abstract Film No. 1, 1967, for instance, turned to liveness as a way of swapping object for experience and engaging with process, materiality, and the body. To perform this piece, export aimed a spotlight at a mirror onto which she poured various liquids; the light reflected off the mirror and onto a screen, producing an abstract pattern changing in time. The artist described the work as “creat[ing] unexpected but basically understandable relations to land art, minimal art and art povera [sic].”4 When EXPORT re-created this landmark work at Oberhausen as Abstract Film No. 2, 2014, she used a Xenon 16-mm projector as light source, included a greater variety of liquids than she had in the late ’60s, and worked with an assistant, which enabled her to incorporate two mirrors into the piece. There are at least two ways to approach this re-presentation. One is to see it first and foremost as a form of historical reenactment, as an index that points back to the work in its original context while acknowledging the impossibility of true repetition. In short, from this perspective, the reenactment offers an opportunity for a richer encounter than documentation can provide. But the sold-out performance of Abstract Film No. 2 also possessed a contemporaneity that stemmed not merely from its status as an ostensibly new work (the artist’s second abstract film, not a reperformance of her first) but from the antagonistic position it took up in relation to the hegemonic form of twenty-first-century liveness. Within a visual culture predicated on the simultaneous dream and nightmare of perpetually available images circulating across numerous formats and exhibition situations, export opted for the inextricable connection of the artist’s body to the work and for that work’s ephemeral existence to be bound to a particular place and time. 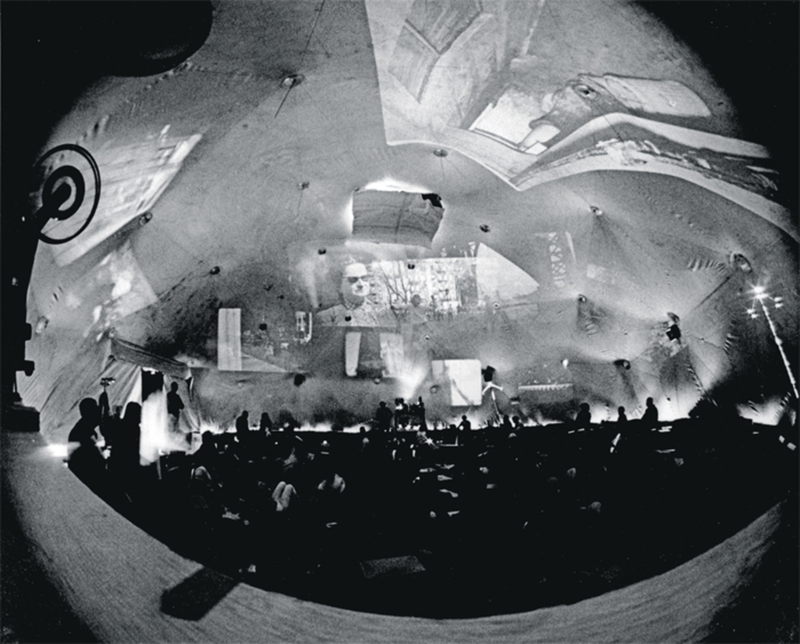 Stan VanDerBeek, Movie-Drome, 1963–65. Performance view, Stony Point, NY, ca. 1965. Liveness today is bifurcated. What digital-media scholar Tara McPherson has called the volitional mobility of the Internet prevails as a dominant experience of liveness: a perpetual now of near-instantaneous accessibility that depends above all on the extreme velocity of digital data and tends to involve the physical separation of those involved.5 It is a liveness of a totally administered life lived on and in the grid, unfolding in the homogeneity of real time. However, in reaction to the near inescapability of this regime, another form of liveness has emerged, one predicated on a desire to withdraw from circulation networks and insistent on the locatedness and collectivity of an aesthetic event that will remain outside the domain of digital reproducibility. One might see performance art as best poised to respond to this demand, but it does so at the risk of positing liveness as a state of ontological purity, a dream of a return to some prelapsarian moment before the invention of radio threw into crisis the previously strong binary opposition between the live and the mediated. The comparative strength of live cinema lies in its ability to produce a resistance to technologically mediated liveness from within that domain. Moreover, it works against common perceptions of its medium by staging a major departure from the persistent alignment of film and video art with access, circulation, and reproducibility. The liveness of the film event is not simply about the unforeseeable but also about the unseeable: It thrives off the charge of the unfolding now while offering its viewers an exclusive and irreproducible shared experience inaccessible to those who weren’t there in person. Curbs on the reproducibility of the moving image in favor of rarity are most often associated with the limited-edition model of distribution, motivated by financial and institutional concerns; here, however, one encounters a very different form of rarity, spurred instead by aesthetic and conceptual interests. The extent to which contemporary film performance may be understood as positioning itself against digital liveness is emphasized by its striking attachment to outmoded technologies. 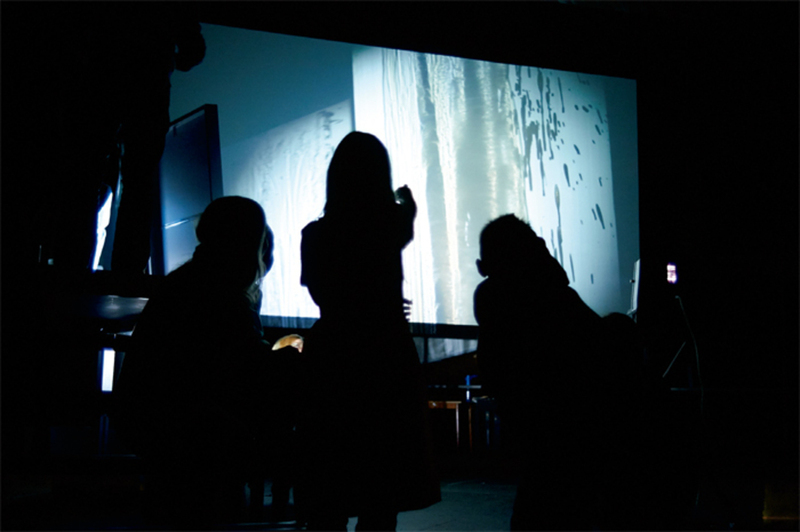 In Oberhausen, Aura Satz, for example, made use of two Kodak Ektapro slide projectors for Blink Comparator: Her Luminous Distance, 2014, a performance delving into the work of fin de siècle astronomer Henrietta Leavitt. Satz created a stroboscopic effect by manually spinning a rotating plate at varying speeds to obscure one or the other of the overlapping images. Sandra Gibson and Luis Recoder’s On/Off, 2004, figured as a classic paean to the specificity of 16-mm projection, with four filmless projectors arranged in a grid, connected to power strips, and switched on and off in rhythmic patterns by the artists, who were seated in front of the audience. What appears to be a binary operation of the sort fundamental to digital mediaon/offturns out to be anything but, as a striking range of lights and darks is generated out of the particularities of each projector. Machinic regularity and rationality are summoned but displaced by chance, variability, and human presence. While many engagements with 16 mm in contemporary art reflect on analog film’s privileged relationship to contingency through an interest in the indexical trace, here one sees this link between old media and contingency articulated differently, in the moment of exhibition. Sandra Gibson and Luis Recoder, Stations of Light: Installation for Two Movie Theaters, One Audience, and Musician, 2014. Not all live cinema is tied to outmoded devices, but it does tend to reflect on medium change. Stations of Light: Installation for Two Movie Theaters, One Audience, and Musician, 2014, Gibson and Recoder’s second contribution to “Film Without Film,” left behind the analog projectors the artists have worked with since 2000 to use Digital Cinema Package projectors for the first time. 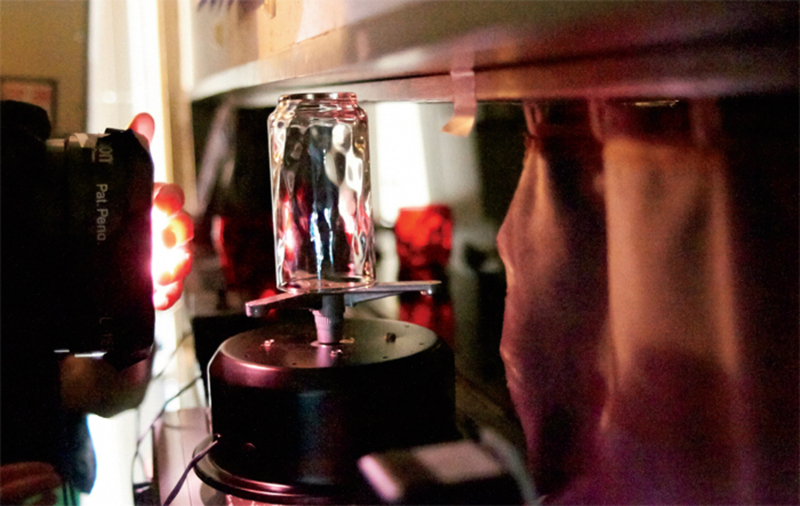 DCP was ushered into multiplexes inside the Trojan horse of 3-D, with the rapid conversion that occurred between 2009 and 2012 casting 35 mm onto the scrap heap of media history. In addition to making virtually inescapable the changes in image quality that accompany all digital projection, the DCP system is notable for its fastidious management of contingency: The projectionist has far fewer ways to intervene in the projection process and, indeed, is becoming an obsolete figure as more and more multiplexes embrace automation. Working with and against the restrictions imposed by the technology, Gibson and Recoder took over the Sunset and Star cinemas at the Lichtburg Filmpalast to performatively intervene in this rationalization of cinematic exhibition. The artists gave three instructions to Taanila: First, he should choose two films of approximately the same length, to project on DCP; second, in making their selection, he should take into consideration how the thematic program of “Film Without Film” might work with films; finally, he should not reveal the identity of the films to the artists or the public. On the evening of the performance, a crowd piled into the Sunset cinema (the show was sold-out), and the film began. Its digital sound track was replaced by a live accompaniment composed by Douglas J. Cuomo, who performed on laptop alongside cellist Dirk Wietheger, while its image was transformed into an ectoplasmic blur. Gibson and Recoder were in the booth, manipulating the projector’s beam of light by means of a rotating piece of glass and color filters that created abstract, gaseous images, at times recalling nineteenth-century spirit photography. About twenty minutes in, the musicians decamped to the other cinema, the Star, and the audience followed. There, a second film was playing, this one even more abstracted than the first by its refractions through a faster-rotating cylinder. The artists’ manipulation of the images served as an allegory of the very idea of the performative event: The images eluded one’s apprehension, sliding, as they did, in and out of recognizability. After some time in this space, the audience returned to the first cinema for the conclusion of the performance. Sandra Gibson and Luis Recoder, Stations of Light: Installation for Two Movie Theaters, One Audience, and Musician, 2014. Performance view, Lichtburg Filmpalast, 60th International Short FilmFestival Oberhausen, Germany, May 2, 2014. Gibson and Recoder stated that their use of two cinemas was inspired by the old 35-mm changeover system, in which the projectionist would switch reels by operating alternating projectors placed side by side. This was largely abandoned with the introduction of the platter system in the ’60s, which initiated an increased automation of projection that finds its apotheosis in DCP. By spatially metaphorizing the changeover system, the artists seek to regain lost contingency. Similarly, the sound and image tracks of Stations of Light staged a tension between the stability of notation and the variability of improvisation. As Cuomo noted in the postscreening Q&A, his composition, though largely set, nevertheless offered opportunities for the cellist to play off the cuff. Meanwhile, the DCP files served as a kind of score from which Gibson and Recoder performed; though this score could be copied (or, better, was a copy), they would produce something from it that would be absolutely singular. In this regard, the pair were interrogating what philosopher Nelson Goodman called the allographic nature of cinema: It is a two-stage art that requires a performative enactment in order to be realized, something that necessarily opens the work to difference, fluctuation, and modification even as it remains itself.6 Stations of Light exploits this opening where conventional exhibition would seek to close it down. With this work, Gibson and Recoder cast into relief the extent to which this performative dimension is always there, even in the most regulated forms of exhibition, such as DCP projection. While one might consider live cinema to be simply a marginal part of the already-marginal domain of practice that is artists’ cinema, there is also a way in which it may be taken as a template for rethinking the cinematic experience tout court. All film screenings are in some sense live events, unique performances of a stable notation that occupy a particular place and time and are collectively shared. This has always been the case, of course, but today attains a new visibility in relation to historically shifting meanings of liveness. As a performing art, cinema ceases to be a reproducible object and becomes instead a singular experiencesomething that exerts a special appeal in the age of digital access. Erika Balsom, a lecturer in film studies and liberal arts at King’s College London, is the author of Exhibiting Cinema in Contemporary Art, published last year by Amsterdam University Press. 1. Mary Ann Doane, “Information, Crisis, Catastrophe,” in The Historical Film: History and Memory in Media, ed. Marcia Landy (London: Athlone Press, 2001), 269. 2. See, for example, Bart Testa, Back and Forth: Early Cinema and the Avant-Garde (Toronto: Art Gallery of Ontario, 1992). 3. Philip Auslander, Liveness: Performance in a Mediatized Culture, 2nd ed. (New York: Routledge, 2008), xii. 4. valie export, quoted in Roswitha Mueller, Valie Export: Fragments of the Imagination (Bloomington: Indiana University Press, 1994), 5. 5. Tara McPherson, “Reload: Liveness, Mobility, and the Web,” in New Media, Old Media: A History and Theory Reader, ed. Wendy Hui Kyong Chun and Thomas Keenan (New York: Routledge, 2006), 199–208. 6. Nelson Goodman, Languages of Art: An Approach to a Theory of Symbols (Indianapolis: Hackett, 1976), 113–21.